PALM SPRINGS, Calif – In the first game at Palm Springs Stadium, the New York Colonials and Washington Blue Sox played to a 3-3 tie. Kosuke Matsumoto drew a walk to start the game, stole second, then came into score on Yuto Tadano’s one-out single. The Colonials came back and took the lead in the top of the second. Brooks Carson drew a leadoff walk and came into score on an Elijah Collins double to tie the game. Lance Montanto drove Collins in with a sacrifice fly later in the inning to take the 2-1 lead. Washington tied the game back up in the bottom of the second. Kodai Kato hit a leadoff single, stole second and third, then scored on a two-out pinch hit single off the bat of Minami Kurahata. The Blue Sox retook the lead in the bottom of the third after a two-out single off the bat of Kato, scoring Tatsunori Negishi. Armett Johnson started the sixth off with a single, stole second and third, and scored the tying run on a Gregory Barnette infield single. Neither team scored in the seventh, so the game ended in a tie. The Colonials pitchers combined to retire the final 13 batters in the game. Game one on the auxiliary field saw the Alberta Grizzly take a 9-2 victory as they lit up the scoreboard against the British Columbia Bombers. The Grizzly attacked quickly in the bottom of the first inning when Luke Bolka scored on an error followed by Mike Hardin’s two-RBI single. Colten Trager later scored on Ryan MacCarrick’s single to give Alberta a 4-0 advantage after one inning of play. In the second inning, Wesley Jones smacked a ball that was mishandled by the Bombers’ shortstop, leading to two runs crossing the plate and a subsequent 6-0 lead for the Grizzly. The Bombers chipped away with a run in the fourth inning courtesy of Garrett Brown’s solo home run. They added another in the fifth due to Jonah Dean-Hargroves’ fielder’s choice groundout to make it 6-2, but that was as close as they would get. Wesley Jones drove a pitch out of the park for a three-run home run to make it 9-2 in the sixth inning, rounding out the game’s scoring. Alex McCune pitched sharply, going all seven innings in a complete-game effort for the Grizzly during which he struck out ten hitters and only gave up five hits, improving his record to 3-1 and lowering his ERA to a minute 0.58. In the second game at the stadium, the Toronto Rush took down the Manitoba North Stars 2-1, running their record to 7-3. After the first two innings went scoreless, the Rush scored in the bottom of the third. Kyle Noel led off the inning with a double, moved to third on a single, and scored on a sacrifice fly off the bat of Tyler Cowles. They would take a 2-0 lead in the fourth when Bryson Conner scored on a throwing error. The North Stars cut the deficit in half in the top of the sixth, as Jacob Karlson drove in Frank Podkul on a sacrifice fly with the bases loaded to round out the scoring. Larry Brown went six innings to earn the win, and despite allowing seven hits, he surrendered just one run, while striking out five. Sam Steeves worked a perfect seventh for the save. 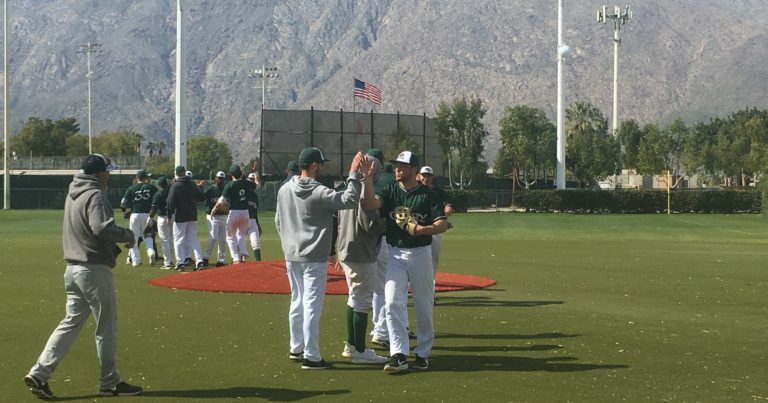 The auxiliary field’s turf surface hosted a defensive battle in game two which eventually saw the Palm Springs Power earn a 4-1 win over the Oregon Lumberjacks. Mark Lynam led off the game with a walk for the Lumberjacks and later scored to make it 1-0 after the first inning of play, but Michael Stryffeler of the Lumberjacks and the Power’s Jordan Matos settled down to engage in a duel that wouldn’t change score until the fifth inning. Stryffeler didn’t allow a hit through 4 ⅓ IP and had six strikeouts before giving way to reliever Tanner Helms, while Matos looked sharp during his outing for the Power, similarly striking out six batters and only giving up one hit and one run. The Power scored all four of their runs in the fifth inning on a combination of walks and hits, highlighted by a two-RBI single off the bat of Nicholas Michaels followed by an RBI single from Won Jie Choi. The Power move to 5-6 on their 2019 CWL campaign while the Lumberjacks are now 5-4 for the season. Thursday at the CWL is out-of-towners day. All U.S. Resident’s outside of the Coachella Valley get in for just $3. Game one at the stadium will be the New York Colonials against the Canada A’s at 10, followed by the Alberta Grizzly and Toronto Rush at 12:30.